KELOWNA, B.C. — Eight long years it took, but the payoff was oh-so-sweet on a beautiful Saturday afternoon in Kelowna. KELOWNA, B.C. — Team Canada will play for gold at the 2018 Winn Rentals World Mixed Curling Championship. KELOWNA, B.C. 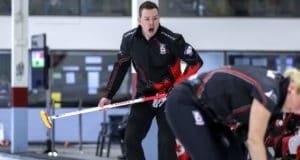 — Just two wins separate Team Canada from a first-ever gold medal at the Winn Rentals World Mixed Curling Championship. KELOWNA, B.C. — It didn’t come easily, but Canada has reached the final eight at the 2018 Winn Rentals World Mixed Curling Championship. KELOWNA, B.C. — Team Canada doesn’t know who it will be playing; it doesn’t know when it will be playing. KELOWNA, B.C. — Mixed curling can be tough on relationships, but Team Canada continues to buck that trend at the 2018 Winn Rentals World Mixed Curling Championship. KELOWNA, B.C. 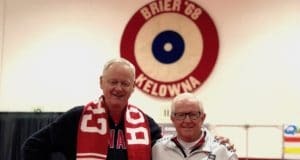 — A world championship is being contested at the Kelowna Curling Club this week, but there’s a logo on the wall at the away end that is a vivid reminder of Kelowna’s biggest-ever curling event, half a century ago. KELOWNA, B.C. — An early loss was one thing, but an early TWO losses would have been entirely another for Team Canada at the 2018 Winn Rentals World Mixed Curling Championship. KELOWNA, B.C. — A slow start proved costly for Team Canada on Sunday afternoon at the 2018 Winn Rentals World Mixed Curling Championship. KELOWNA, B.C. — Expectations were high for the home team, and the opening day did nothing to dampen those expectations at the 2018 Winn Rentals World Mixed Curling Championship. KELOWNA, B.C. — It had been a long wait to put on the Maple Leaf, but it was worth it for Mike Anderson’s Canadian mixed curling team. Team Canada will have home-ice advantage for the first time when the 2018 Winn Rentals World Mixed Curling Championship gets underway on Saturday at the Kelowna (B.C.) Curling Club. 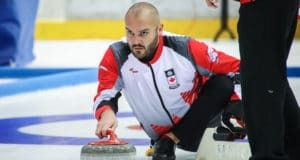 “We haven’t hit our stride quite yet, but we’ve made the right shots at the right time” said Team Canada skip Trevor Bonot after stealing the final end on the way to a 6-5 win over England’s Andrew Woolston on Monday morning at the World Mixed Curling Championship in Champéry, Switzerland. 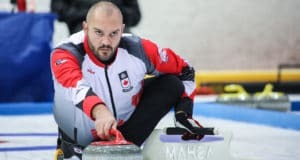 Team Canada’s Trevor Bonot stole his way to a 9-2 win to kick off the 2017 World Mixed Curling Championship today in Champéry, Switzerland. Canada’s Marliese Kasner and Dustin Kalthoff added two more wins to their undefeated record on Tuesday at the 2016 World Mixed Doubles Curling Championships taking place in Karlstad, Sweden.